The upgrade pathways aboard the ship are also a nice touch, allowing you to customise and improve your units to better suit your style of play. Unit and structure upgrades can be found in the armoury and vary from adding armour or aiding healing to increasing unit speed or range. Changes made in the ship’s research lab are much more radical, allowing you to instantly deploy buildings or auto heal all your vehicles, but at the cost of permanently locking out an alternative upgrade. The supply of research materials and cash is well weighted as you advance through the game, and you’ll often have to choose and compromise over what to pimp out, and what to leave standard. The gentle increase in research and technology mirrors StarCraft 2’s immaculate learning curve, which has been shaped to introduce new units and structures mission by mission, while not frustrating more experienced players. There’s an extensive tutorial session and tool tips throughout, but the mission structure is more than sufficient, combining early hand holding with plenty of run before you walk moments to keep things exciting. 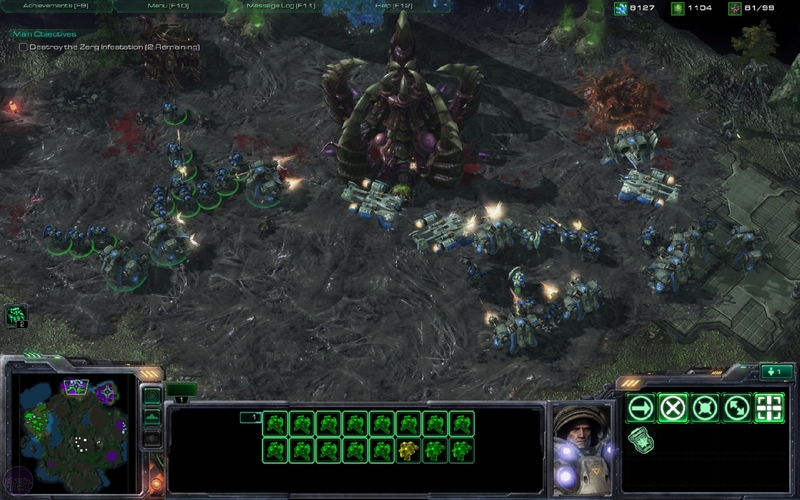 Having introduced the basics and gotten you comfortable with how to run and build a base, the sheer scale of StarCraft 2’s unit choice can become overwhelming though. With five kinds of infantry, vehicles, and aircraft it can be difficult to know the best tool for the job, especially as many units, like the transforming Viking jet fighter/walker, are multi-purpose. Again, it’ll be down to player preference whether you favour one unit or another, but we’d have preferred a more direct tech tree rather than one where many unit roles overlap. Taking down enemy aircraft for example is best done with an air-to-air fighter, but can be just as easily done with a group of marines, or battle walkers. It’s not so much a rock, paper, scissors formula as rock, paper, scissors, air, water, fire, gun, nuclear bomb, with counters for any particular unit much more varied. 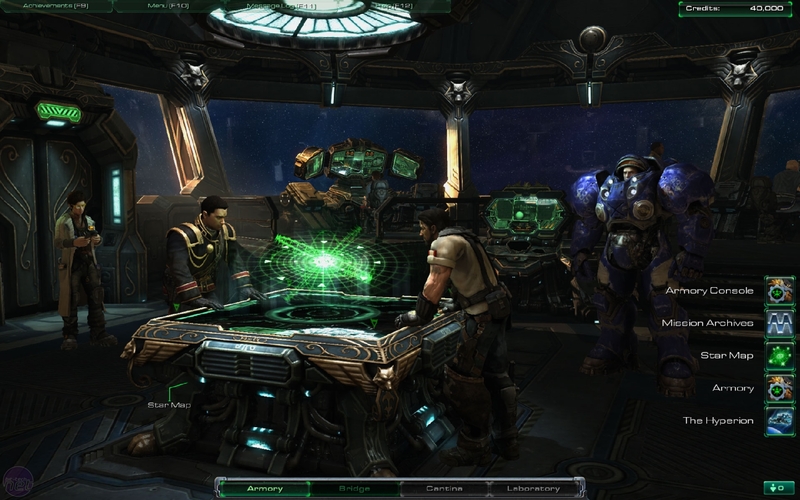 With such a large cast of units and upgrades being gradually introduced, it’s admirable that it’s the story line and set pieces that steal the show in StarCraft 2’s missions rather than the hardware, with the extra units merely supplementing what’s happening rather than being the focus. Working within the confines of the core base building and resource collection foundation the variety of missions is fantastic and while we’re loath to reveal anything that might spoil the game’s surprises, needless to say there are plenty of “remember that bit...” moments that had us grinning like loons. The all-round superb voice acting and scripting have a big part to play here, giving genuine life and appeal to game’s characters, with space convict Tychus stealing the scene every time he pops up. The bridge of your ship is where to pick your missions, and occasionally yell at your captain. How you approach the game’s missions though is entirely up to you. The storyline is split between several different threads each handled predominately by a single character on your crew, through which you can advance in whatever order you choose. It’s another way of keeping you interested, allowing a change of tack when you’ve had enough of saving colonists and want to blast some corrupt government scum instead. This approach also allows the plot to become much more intricate and introduce more characters than would have been comfortable otherwise and again serves to add depth to the game’s universe. We’re used to games where it’s very much a black and white, us and them setup, but in StarCraft 2 there are plenty of shades of grey between the two. Electronic Arts has rubbished rumours that Star Wars: The Old Republic has cost $300 million to make.